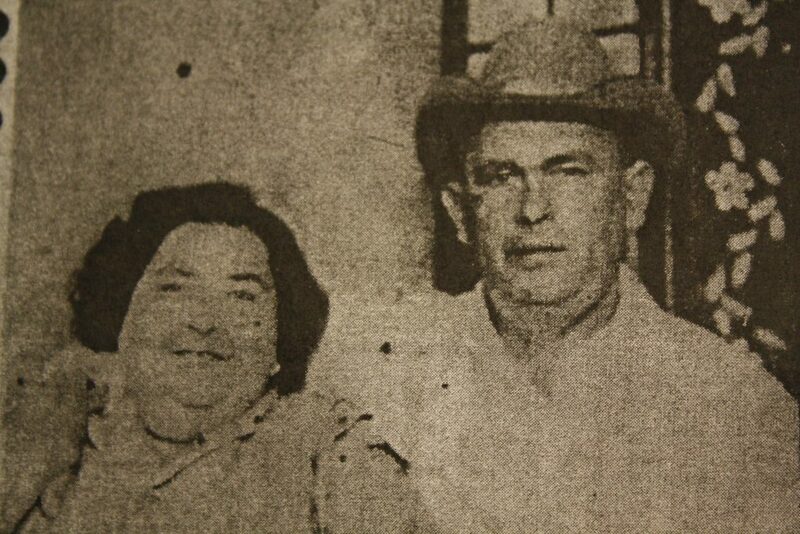 Thus began the story told by Bobby Woodard in an interview to the Review-Appeal on January 17, 1950, barely a month after he helped Betty and, her son, Sherman Burges dump the bloody body of Rosa Mary Dean by the incinerator behind the Franklin High School gym off what is now West Fowlkes Street. Recently Neighbors podcast, on Nashville Public Radio, did an episode on Dean’s murder and the effort by a local author to give her unmarked grave a headstone. That story will be told in another post. This is the story of Dean’s murder. 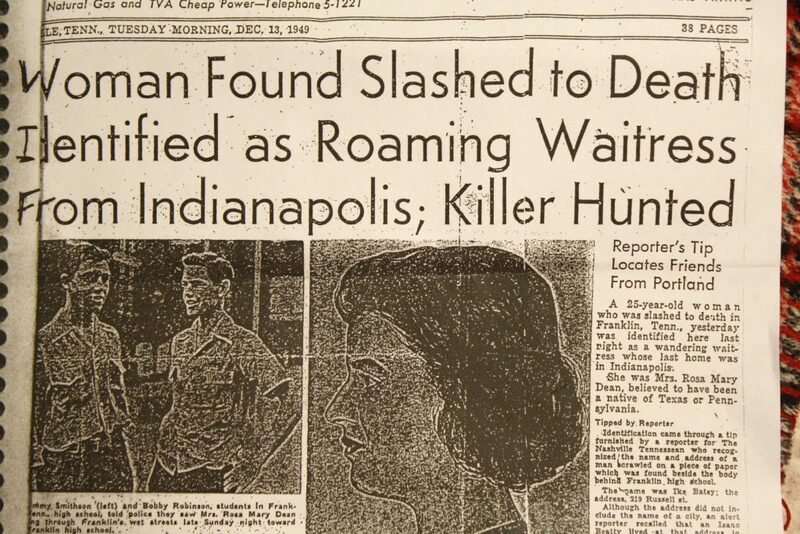 High school students found Dean’s body, throat slashed and nearly decapitated, on the morning of December 12, 1949. Dean, 25, was from out of town — Indianapolis via Uniontown, Penn., where her husband then her twins died. She had been on her way south to stay with a family she met from Portland, Tenn., in Indianapolis, who offered her help if she ever needed a place to start over. When they weren’t home, she took the train to Franklin, a place she stayed years before, and on this wild, creepy night would be her end. But that all came later. On that morning, in the small town of Franklin where everybody knew everybody, nobody knew her. Nobody except Betty and Sherman Burge. Dean, in dire straits, came to Betty Burge’s boarding house– which also was on what is now Fowlkes Street just up the street from the gym– that night with the idea of blackmail. Five years earlier, in 1944, she had stayed there, which was called Burge House and home usually to from 10 to 12 boarders. What she witnessed during her time here led to her end. Rosa found out that Betty, nearly 60 at the time, was having affair with John Golden, 65 at the time. Allegedly, he offered Betty $100 and a marriage contract if she would help murder his wife, Sally. She did, and they dumped her body in the Harpeth River. Allegedly Betty held Sally down while John beat her with his cane. Golden was caught, convicted and sentenced to 60 years in prison. But Betty – after numerous residents at her boarding house said she was home at the time – skated free. Five years later Dean would claim to have seen the whole thing. With no money and no where to stay, on Dec. 11, 1949, she got off the train and walked up Columbia Avenue, sometime around 11:30 p.m.
She got to the Burge and laid her cards on the table. Woodard, a boarder, was asleep in his upstairs bedroom after a long, lazy Sunday of drinking, when in the middle of the night he heard Sherman’s voice calling. Sherman then wrapped Dean up in a blanket, and they carried her out into the night, toward the gym. Only hours later, in the light of day, Jimmy Smithson and Bobby Robinson, students at Franklin High School which was located up on the hill next to Carter House, found her. “The cards fell wrong at the Burge House that night,” Woodard said in his interview. Police canvassed the area, and came upon the Burge Home. All the windows were dirty, as Jakob Lewis relates in his Neighbors podcast on the murder. Except for one. It was wiped clean, but smears of blood were in the cracks around it. Police also found bloody overalls. Sherman claimed to work in a slaughterhouse, so the evidence was sent to Nashville to test whether it was human or animal blood. It came back, of course, as human. Mother and son were arrested, and the trial turned into a circus. The Review-Appeal, covering the trial which began in January, said 15,000 people swarmed to catch a glimpse of the proceedings. Woodard, originally charged as accessory after the fact, testified against mother and son. Betty became the first woman in Tennessee to be sentenced to death by electrocution, though the sentences were reduced to life on appeal. Dean was buried in an unmarked grave in Mt. Hope Cemetery. As Lewis points out in Neighbors, both Burges were also eventually buried there. They got headstones. Dean did not, until just a few weeks ago. But that story is for part two.